Sculptor and painter Kelly Borsheim splits her time living in Florence, Italy, and in central Texas, USA, near Austin, She started this blog to share some of her artistic life and observations with you. Visit her fine art work online at: http://www.borsheimarts.com Thank you so much for your interest! Recently I attended “Mondays at the Markets” with the fabulous Judy Witts Francini. 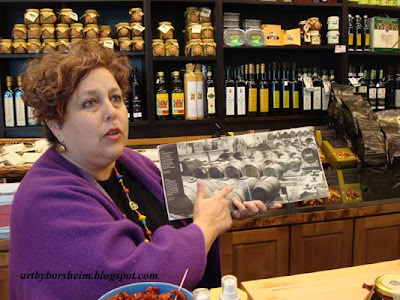 Judy not only teaches Italian cooking classes, but she gives tours on how to buy the right ingredients (and wines), blogs and publishes cooking books, and SO much more. 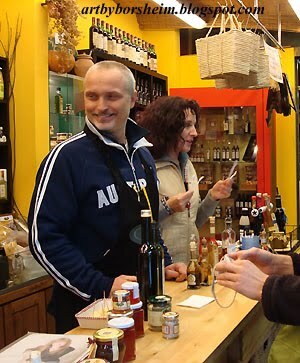 Monday, she took her small group (always small, she says, she prefers it that way) on a tour of the Mercato Centrale di San Lorenzo (central market) in Florence, Italy, as well as many of the surrounding merchants that she adores. There was so much tasting and so many scrumptious things that I had to narrow it down for this blog post. 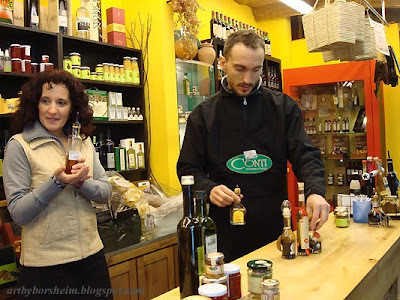 I choose today to talk about the Conti’s balsamico. 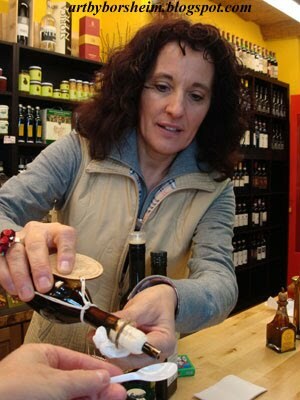 I have tasted balsamic vinegar plenty of times – it is a staple in Italian homes and goes well on salads and even pasta. But what we tasted this day was not this. Sure it had the similar tanginess to it, but was so much more intense and pure of flavor (and I think Judy said – no vinegar)! One drop of this thick concoction, and one was thinking of the nectar of the gods. I am not exaggerating. These images were taken at the Conti’s tasting table inside of the mercato centrale. The first image is of the handsome Stefano and his charming wife Grazia. In the second image, Grazia is showing us one of the family’s offerings, while their elegant and perhaps modest son Manuel lays out the tastings of the day. 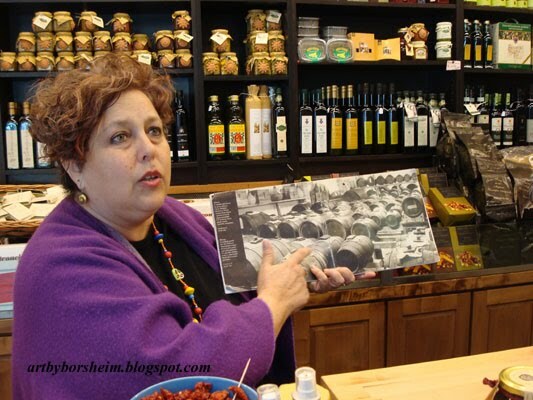 In this third image, the fabulous Judy [wearing Florentine purple, the color of the local soccer (calcio) team], explains to us how balsamico is created over a period of many years, moved from one barrel into the next in line. In the fourth image, the lovely Grazia waits for the balsamico to find its way finally to my spoon. When one knows of the time involved to create such treasures and how long it will last (a tiny amount goes a long way), the price becomes reasonable indeed. And just look at some of their offerings! 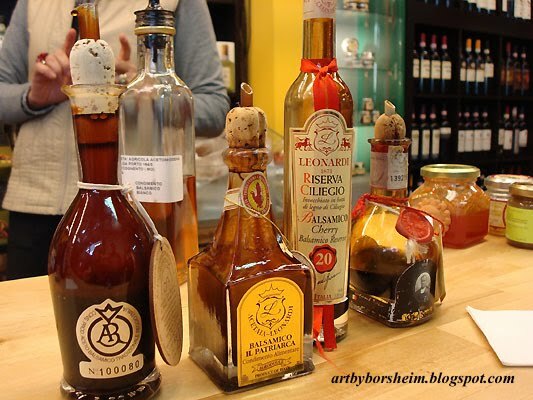 The bottles are beautiful, as well as the treasures inside: worth every euro. Life can be a dream when we follow our passions. Thanks so much to the Conti family for sharing theirs. Just wanted to acknowledge this: My friend Keith Hogan left this world on the 14th of April. He was a strong advocate for people with disabilities and had the sweetest soul. Kelly, you did it again. You shared in such an elegant and colorful way that we can all be next to you with our spoons and tongues hanging out.. Sorry to hear about you friend Keith... life is always too short and no one plans to leave the party. Befriend Kelly on Facebook . . .
Help Rudy Eat and Smile! Help Rudy Sanchez receive some teeth. Please donate or buy some of Kelly's Art Giclees from Italia. Prefer to Support Blog with Euros?? Ringrazie per la vostra generosità. Thank you and Grazie Mille!